There has been a series of reports which shows self-declared Islamic State militants causing severe damage to antiquities and heritage sites in Iraq and Syria: at the museum in Mosul, perhaps causing destruction at sites such as the Nergal gate in Ninevah, perhaps destruction at Hatra, and maybe even damage to the ancient city of Ninevah as well. The volume of reporting is hard to digest fully, but the news is almost all very very bad. Reporting on these events is exceedingly difficult as these areas are controlled by the so-called Islamic State. When we consider that foreign reporters and aid workers have been kidnapped and killed in public executions when their ransoms are not paid, we can see how precarious and difficult it will be, and how patient we all must be in waiting for confirmation of destruction. If we get whipped up into a panic about the wrong things, we will neglect to pay attention to the right things. Reporting “we don’t know” like it is reality is a major distraction. It is how confirmed crimes and real problems are hidden. It also does ISIS’ PR for them without them, you know, actually having to do much work for it. It gives them power. I am simply not willing to do that. The Syrian team had to keep the project secret so the Ma’arra museum wouldn’t be targeted. They needed a cover story to explain why they were bringing in so much Tyvek. They used the protective sheeting to wrap 1,600 square feet of ancient mosaics. The next step was to protect the Ma’arra museum itself, says Amr al-Azm, a Damascus-trained archaeologist who now teaches Middle Eastern history in Ohio. Some of the “Monuments Men” of Syria are his former students. “We decided the best way to do this was to actually use a technique that was very commonly employed during the Second World War in Europe and the First World War — and that’s to sandbag,” Azm says. The sandbags are now stacked on the inside walls of the museum, shielding the mosaics from the blast of regime jets and opportunistic looting. The sacred value of holy objects in the pre-modern period was understood to be particular, not universal. But those who hold museum objects to be sacred do not think that their value is particular. On the contrary, they insist that a museum artifact’s sacred value is universal. They may state this on objective or scientific grounds — of historical value — or on aesthetic grounds, but however they do it, the claim made as a universal. And what’s more it’s an absolutist claim, since they also insist that anyone who disagrees with this proposition is, in effect, uneducated, uncultured and probably a barbarian. No church ever insisted that its objects of adoration were to be venerated by believers of other faiths. But this is exactly what museums ask of us in the modern period. Now for those people who deviate from the modern belief in museum artifacts, the people who “fail to appreciate” the value of things like classical statues or antiquities. The vast majority of humanity fit into this group because they are too busy trying to live their lives to think about very old objects. And because their lives do not intersect meaningfully with those institutions that inculcate the modern veneration of antiquities — museums, universities, antiquarian societies — they are mostly indifferent. In this regard, it is important to remember how exclusive and exclusionary the institutions of archaeology and the museum have been for most of the modern period. For most of the modern period most of the world’s largest museums have been off limits to most people. While institutions like the British Museum relied on state subsidies, they excluded the vast majority of British citizens by way of dress codes, entrance fees or by simply limiting their opening hours to times when most people had to be at jobs. Archaeologists and preservationists, used to battling mundane enemies like weather and development, lament that in areas held by the Islamic State there is little they can do but document the destruction. Some have even called for airstrikes, not the usual province of Iraq’s cultural elite. Mr. Rashid and his boss, the minister, Adel Shirshab, both called for American-led coalition warplanes to strike militants approaching other historic sites. On Sunday, the officials took their latest step in seeking designation of the ruins of ancient Babylon as a Unesco world heritage site, hoping for a measure of protection by the United Nations. Yet the prospect feels like thin armor given the damage wrought to other Unesco designated sites, like Hatra in Iraq, and, the Krak des Chevaliers crusader castle and the Old City of Aleppo in Syria. Those Syrian sites are victims not of the Islamic State, but of four years of conflict between government and opposition forces, who shelled them and used them for cover. But as Abdulameer Hamdani has confirmed for me, Hatra is isolated in the desert with no population around it . . . Which raises the question: If Hatra is indeed now being razed, why did the coalition not bomb the road or the bulldozers and truckloads of ISIS fanatics to prevent this from happening (and not incidentally to kill some of these murderous thugs)? Hatra’s unique position between east and west produced an outpouring of art unique in the Parthian empire. Influences from east and west mixed to create a very naturalistic but still unmistakably eastern artistic style. Here gorgon heads adorned temples to Near Eastern gods alongside Aramaic inscriptions. Mesopotamian deities such as Shamash and Nergal were depicted alongside Greco-Roman deities such as Hercules. Classical nudes and statues adorned in ornate Parthian robes existed side by side. One statue of Apollo the Roman sun god even featured symbols of Shamash the Near Eastern sun god on his clothing. The damage by ISIS to the artistic legacy of Hatra has been catastrophic. This tragedy is compounded by the fact that Hatrene sculpture has been chronically understudied. Almost all of it was excavated in the 20th century and the finds never left Iraq. The primary publication of the finds is in an Arabic-language book often inaccessible in the West. Very few scholars outside of Iraq have had the opportunity to study the statues. Anne Barnard, Jihadists May Have Wrecked an Ancient Iraqi Site, The N.Y. Times, Mar. 7, 2015. Anne Barnard, Race in Iraq and Syria to Record and Shield Art Falling to ISIS, The N.Y. Times, Mar. 8, 2015. Deborah Amos Facebook Twitter Alison Meuse Twitter, In Syria, Archaeologists Risk Their Lives To Protect Ancient Heritage, NPR.org. 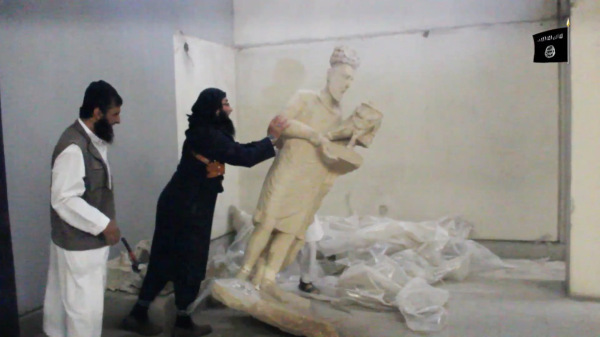 On the Iconoclasm of Isis, Elliott Colla. Poor reporting of the destruction of heritage threatens our ability to protect the past. | Anonymous Swiss Collector. I can’t help but wonder if the reports about Ma’arra museum are really well advised. Sure, they purport to show that archaeologists and museum staff are trying to prevent destruction, but is it wise to broadcast details to the entire world? Does anyone believe that ISIS has no ISP? It reeks sadly of special interest back patting. If the threat were genuine, and the prevention altruistic, why announce the precautions while the threat remains? The devastation in Syria and Iraq is certainly real and a disaster in everyone’s eyes. Is it really necessary to play mind games with such a tragedy?